Adium is a open source instant messaging application on Mac OS X with a cute icon of a green duck, and it is free for Mac users to use. It may be easy for users to utilize and improve Adium on Mac, yet difficult to uninstall thoroughly from Mac OS X. Today we are going to talk about how to remove Adium completely from Mac. If you are on a rush, you can get a smart tool to help you finish your removal. If you are OK to go through the details, just continue your reading. 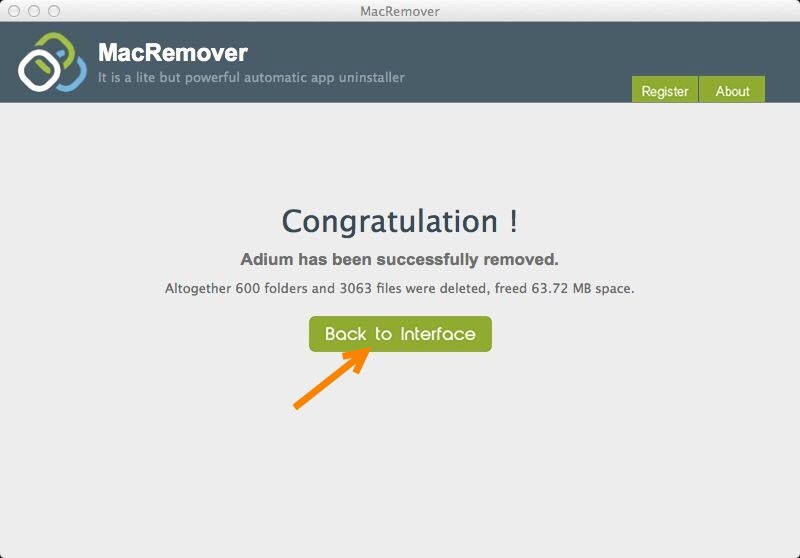 I prefer to post this easiest uninstall method to help you remove Adium from your Mac because maybe you need to perform your removal of Adium badly. Well, let’s just come to the point. This method is also called the automatic way to remove Adium, by which you can easily finish your uninstall of Adium in seconds. Before you proceed your uninstall, you will need a tool to help you, but you will be charge of nothing to download the uninstaller. 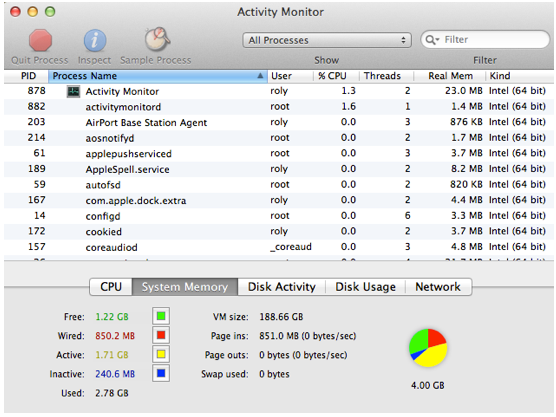 Step 2: Make a single click on the icon of Adium, and then click “Run Analysis”. If you can find your Adium on the uninstaller infer-face, just click “reflesh” and then perform the Run Analysis. Step 3: Make two clicks to finish your removal of Adium. Click “Complete Uninstall” after the remover scanned out all the components of Adium and displays all the leftovers on the interface. Step 4: There are a congratulations interface just to tell you that you have successfully uninstalled Adium from your Mac completely. You can click “Back to Interface” and then quit the remover. 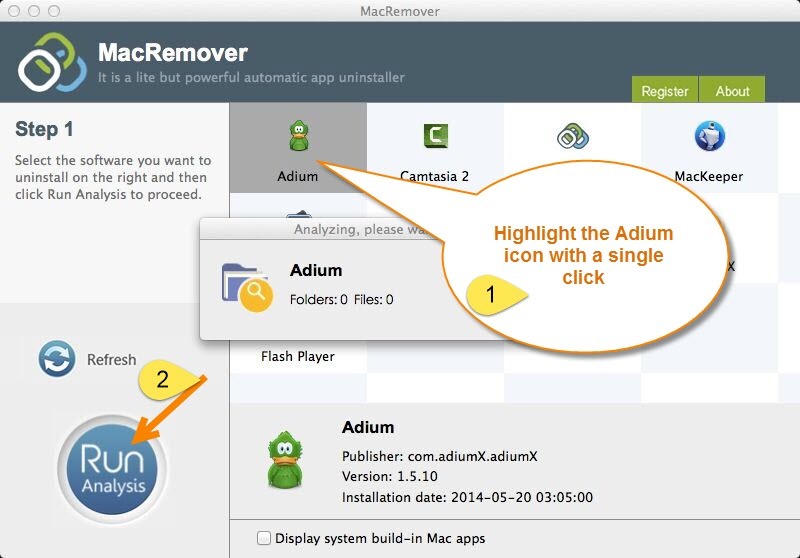 All above is how the automatic way works to uninstall Adium from Mac for you. The biggest differences between the automatic way and the regular way, which is going to be shown in the following part, is that you don’t need to search for the components of Adium, and move the components to the trash by yourself. 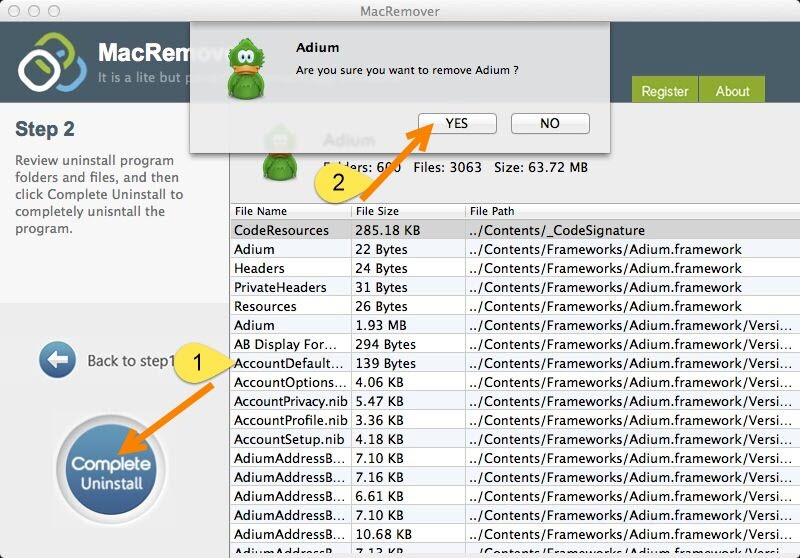 The smart remover/uninstaller will scan out all the leftovers of Adium when you proceed the Run Analysis function. Thus it is strongly recommended to you to adopt this method and save your time. Step 1: Quit all the processes of Adium. This is the necessary step before you start your uninstall of it, and ensures that you can execute your removal. So, enter your Activity Monitor,, change the filter into “All Process”, click on the Adium (if it is active), and then click “Quit Process”. There is another way to quit the main process of Adium, especially when the process of Adium was frozen up. 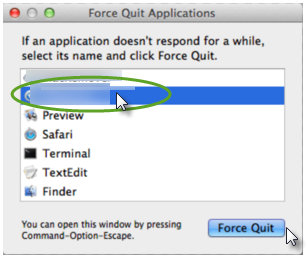 Press the Command+Option+ Esc keys to launch your Activity Monitor, click Adium, click “Force Quit” and then confirm your performance in the pop-up box. Step 2: Remove the main file of Adium by dragging the icon to the Trash. Step 3: Open Finder, head to the GO menu,and select Library. If you can’t find Library directly, press the Option key on your keyboard after you click on Go and see the drop-down list, and then click Library. Step 4: Search for all the components of Adium and trash them all. The components of Adium such as the settings, chat transcripts, Xtras, the Address Book scripts, logs, caches and so on are usually stored in the folders /Library/ Application Support/, /Library/Preferences/ and also /Library/Caches/. Thus you have to detect the components in the folders one by one, and delete all the files in each folder respectively. Step 5: Clear the Trash. Having gone through all the previous steps, you need to clean up your Trash and finish your task to remove Adium. 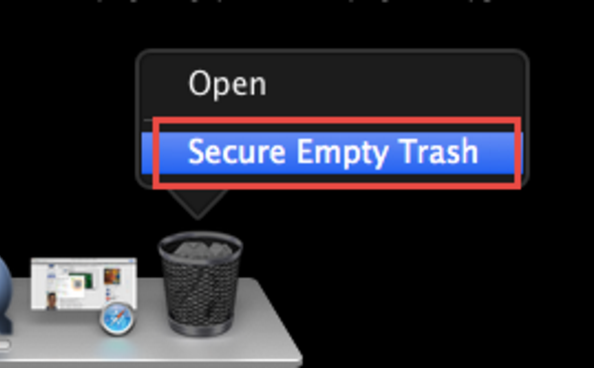 Right click the Trash icon, click “Secure Empty Trash” and then make confirmation of your operation. Remember that this step cannot undo, so please make sure there are no mistakes during your removal. There are all the instructions of how to remove Adium manually. Compared with the automatic way, the latter is obviously more complex and is time-consuming. Therefore, it is not so recommended to you. 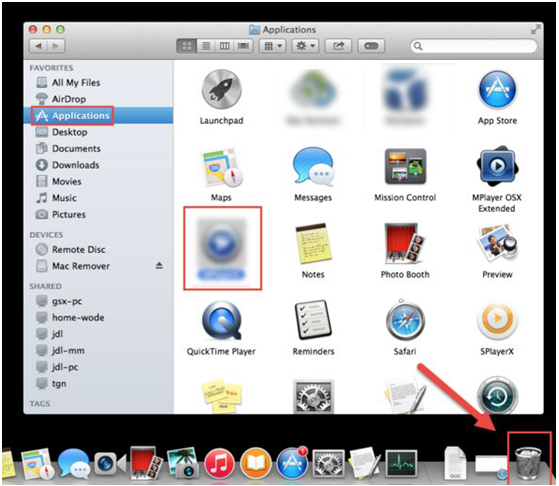 Besides, to remove Adium via a smart remover is easy to handle for all levels of Mac users. So if you wanna remove Adium or some other applications from your Mac, why not get a free remover and try a fast method to achieve your removal of it?